The drive or flight to Boreal Bay Lodge features a winding highway route with splendid picturesque views of skies, lakes, rock formations and green wilderness. We recommend having the camera handy because you may encounter bear, moose, elk, deer, fox and even a timberwolf. Guests are encouraged to stop along the way to take a closer look at the all the things which make the boreal forest such an amazing place. Boreal Bay Lodge is a resort located on a bay on pristine Kakagi Lake. The water is crystal clear and the air is fresh scented by pine trees and forest flowers. It is a place of peacefulness and solitude. While relaxing and enjoying the view of Kakagi Lake you may see loons, eagles, seagulls, a variety of ducks and the splash of a fish. You may hear the bugle of an elk or the baying of a momma moose calling to her calf. Even the playful otters might hop out of the water or a blue heroin may land close by as the busy kingfisher scouts for fish in the bay. The glaciers from long ago left this area with beautiful rock formations. The tiny pebbles to rock walls extended hundreds of feet toward the sky. On the north side bay of Boreal Bay Lodge we have a solid rock point with an old log cabin on top. This makes a pleasant place to find some solitude and have a great view of the whole resort and bay. 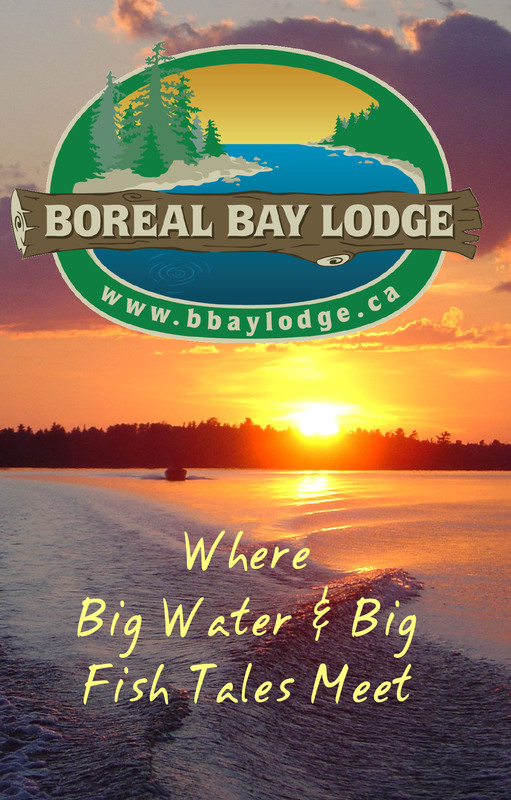 On the water front, Boreal Bay Lodge has a beach and 6 docks. The beach offers a great place to swim and cool off in the clear refreshing waters of Kakagi Lake. The docks all have benches on the ends. Small children to elder adults like to sit and even fish from our docks. It’s always interesting to find out what fish are around the docks. There is bass, perch, sunfish, northerns and the mighty Muskie. One of our guests has proved that the mighty Muskie can be no match for the small kiddie pole as the line broke and the fish swam away. Ideas and games for traveling with children are listed at the end of Attractions. Kakagi Lake is always a 28,000 acre adventure waiting for you. There are many islands and chains of islands which range from the lone boulder to one of the biggest being 2 Mile Island. The smaller islands offer children a wonderful adventure to be able to walk the whole island. One guest even discovered the rare prickly pear cactus. There are great crops of blueberries on some of the islands. It is a good idea to keep your eyes opened for the wildlife while on the lake. There are many loons on the lake and they seem very comfortable with boats sharing their lake. Bears have been seen swimming from island-to-island. There are many deer in the area and they often appear on the shore lines. One group of guests was surprised as a bull moose surfaced from an underwater dive near their boat while they were out fishing. Unfortunately the fishermen were too amazed to capture this magical moment on film. Numerous portage lakes offer our guests adventures and lifelong memories of hiking through the north woods trails to see and fish a lake, which you might have all to yourself for the day. We have private dock and launch access to world famous fishing on Lake of the Woods. The historic legends, fishing and wilderness scenery on Lake of the Woods makes it a great place to visit, while at Boreal Bay Lodge. As the day winds down, we offer many areas to enjoy an evening campfire to share tales with friend and view the night stars. Without city lights in our area, the stars are much more visible and feel very near. If luck is with us, we often encounter sightings of the fabulous northern lights. On Hwy 71 just north of Boreal Bay lodge there is an overlook of Lake Kakagi. This is a nice spot to take pictures or just relax and enjoy the view. Boreal Bay Lodge is about 5 miles north from Nestor Falls, Ontario. Nestor Falls is 65 miles from Fort Frances, Ontario and International Falls Minnesota. Nestor Falls is a small town on Sabaskong Bay along the eastern shores of Lake of the Woods. The falls – is located right under HWY 71. There is a small park where you can easily see the falls and get some great pictures. Pelicans frequent the falls currents and offer an entertaining sight as they fish. Click the following link for movie from a drive down an old logging road. Emo is 43 miles from Nestor Falls, Ontario, 18 miles from Fort Frances. This town is located right on HWY 71 and the rainy river. On the river front there is a beautiful park that is great for kids. The park is the Lions Park and there is also a dock onto the Rainy River. Stock Car Racing – Emo has a speedway that offers stock car racing during the summer season. Norlund Chapel – is one of the smallest churches in the world and is located right in Emo. The Rainy River District Women’s Institute Museum – offers an interesting insight of the early settlers and pioneers in this area. Sioux Narrows is 25 miles from Nestor Falls. Gift/Souvenir Stores – several are located in this small town to check out. On your scenic drive to Kenora, check out Rushing River which located right on HWY 17. It is a beautiful spot to take pictures and view the Rushing River rapids. Kenora is 69 miles from Nestor Falls. It is located on the northern shores of Lake of the Woods. Shopping – Kenora offers several interesting stores to shop including gift and souvenir stores. Kenora’s Harbourfront – is truly beautiful with breath taking view of Lake of the Woods. There is a very nice park for the children to play in right next to the Thistle Pavilion (a tourism building). You can get maps, walking tour guides from the knowledgeable staff. Also in the Harbourfront area are outdoor restaurants and food vendors to satisfy your hunger. Right in the bay of the waterfront is a huge water fountain. MS Kenora – is also docked in the Harbourfront. You could enjoy a dinner cruise on this ship. Huskie the Muskie – is Kenora’s informal mascot and is located on Kenora’s harbourfront. You can’t miss Huskie the Muskie as it stands 40 feet high. History of Kenora Murals – are on buildings thru out the downtown area. Ideas for traveling with children. -Get a map and mark the route you are taking. Have your children follow the map as you drive. Can they tell you what city is next? Can they figure out how long it takes to get there? -Make up stories about what is going to happen once you get there. Take turns telling stories, the funnier the better! -Listen to music that your children like. Sing a long with the songs. Make up your own songs. -Children love to hear stories about when their parents were young. Tell about vacations you took as a child. -Can you find all the letters of the alphabet? On street signs? Store signs? License plates? Can you find the numbers 0 thru 9? -Travel Scavenger Hunt � Give each child a list of items to watch for while traveling. Just check each item when found. The list can be made up ahead of time and adjusted for scenery. For younger children, you can put a picture by each object. List of ideas � flashing red lights, bus, dog, cat, train, a church, a school, a bike, a pool, cows, horses, birds, tractor, gas station, barn, a baby, a girl, a boy, an old man, an old woman, a white flower, a red flower, a yellow flower, a blue flower, a pink flower, a purple flower, police car, fire truck, silo, motorcycle, a boat, a plane, chickens, etc. Need some jokes to go with the game? How does a farmer count his cows? What do cows do to relax? -Have your children help you pack for the fishing trip and help pack munchies. -Take time to stop, look, and listen while on the lake. -How many loons did you see today? -Who can spot the first eagle? -Watch the shore lines of the islands, did you see any animals? -Look for the alphabet in nature, can you find all the letters? Does that rock look like an �A�? Does that rock look like a �B�? Does that leaf look like a �C�? Is that cloud shaped like a �D�? The resort is also an awesome place for a scavenger hunt, please come up to the lodge if you need any help setting up a hunt.